focusing on fitness...24 hours at a time. Okay, I’m not going to lie and tell you that this is a healthy recipe. But I will tell you that it’s probably the healthiest (and most obscenely delicious) version of a chocolate cupcake you’ll ever try, thanks to all the good-for-you ingredients (high-fiber coconut flour! Raw cacao powder!) and absence of crap (refined flour and sugar!). It’s also Whole Life Challenge Advanced Level Compliant (and Paleo, for those of you in that camp). The recipe is essentially a modified version of my fabulous teammate Xen Buchanan’s Clean Banana Nut Muffins, which I blogged about during the last challenge. You simply replace the cinnamon and nutmeg with a heaping dose of cacao powder and wind up with what amounts to a decadent chocolate-walnut muffin (the walnuts are of course optional). To kick it up a notch and make it a seriously over-the-top dessert, I mixed up a batch of the Rawtarian chocolate frosting that I recommended in my Chocolate Fudge recipe a while back. 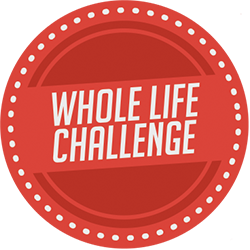 The Whole Life Challenge has started again, and that means I’m going to be posting new recipes, along with other random thoughts on health and fitness if/when they occur to me! During the last challenge, I enjoyed a whole lot of hot soups—and I’m still planning on having quite a few of them. But now that it’s spring (almost summer! ), I’m also excited to explore some cold soup options—and so today, I decided to throw together a big batch of gazpacho. I know a lot of people feel like gazpacho is nothing more than salsa under another name, but I find that if you add the right kinds of ingredients, seasonings and garnish, and puree it just enough, it makes an amazing (and seriously filling) meal. It’s also great if you’re trying to keep your calories in check. I garnished mine with avocado (next time I’m going to add even more!) and had a hard-boiled egg on the side for some extra protein. Best of all? This baby is 100 percent Advanced Rx compliant (and also vegan). Hope you enjoy it! Copyright Alexa Joy Sherman and Clean for a Day. All rights reserved. Content on this website may not be duplicated without written permission of the host.